This music box with Mole and his faithful friend should be in the room of every little fan of the children's hero. The box is made of high-quality and durable wood, and its dimensions are 12 x 12 x 11cm. Your kids will delight in the pleasing melodies and cheerful design, which makes it an ornament for every child's room. This toy meets the European Parliament and of the Council 2009/48/EC of 18 June 2009 on the safety of toys and complies with all Czech legislation. A declaration of CE conformity is included. 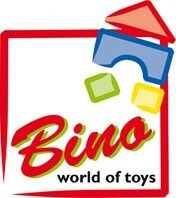 For shipping to other EU countries visit this page Bino Music Box - Mole. Für Versand nach Deutschland, besuchen Sie bitte Bino Music Box Maulwurf. Chcete doručit zboží do Česka? Prohlédněte si Bino Hrací skříňka - Krteček. Chcete doručiť tovar na Slovensko? Prezrite si Bino Hracia skrinka - Krtko. Für Versand nach Österreich, besuchen Sie bitte Bino Music Box Maulwurf. Magyarországra történő kiszállításért tekintse meg ezt a termékoldalt: Kisvakondos zenedoboz.